I recently came across a lot of used wine corks. I mean- a lot. A whole bag full. Wouldn't you know that right when I was ready to indeed trash it, I finally found a craft project right up my alley! My inspiration came from this blog post and I was immediately in. I couldn't wait. Even better, my mom's birthday was coming up. We all know mom's love homemade presents from their kids! Maybe not so much when their kids are almost 30....now that I think of it. Oh well. 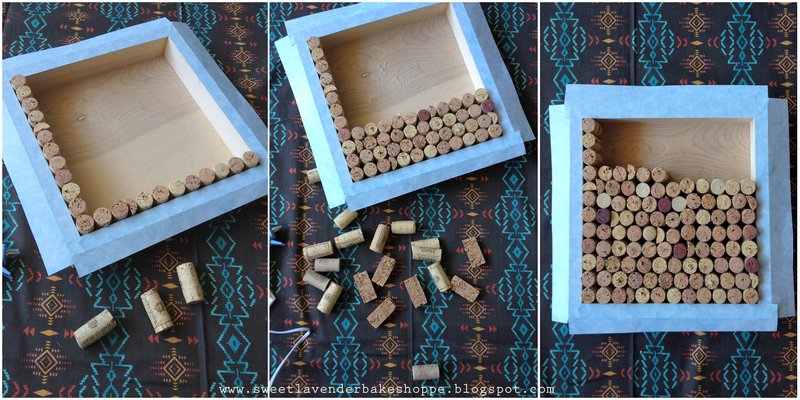 But hey, in my defense this DIY wine cork cork-board is a lot better than a painted raw noodle necklace, RIGHT? At least this is something she can actually use! I'm really trying to justify my point here. 1. It's easy as pie! SO EASY. 2. It uses (hopefully) things you already have...or things you can indeed look for and start saving (therefore keeping out of the trash!) Yay for recycling! I'm all about that! 3. My husband had JUST made a few custom wooden box frames for a project he would be doing and was so generous enough to let me snag one. Isn't he such a keeper?? So I was totally set. Don't have that stuff lying around (honestly, who would other than us weirdos)...no problem! You can buy a box frame for real cheap anywhere you'd find frames. For the corks- you can actually find used corks on sites such as Amazon.com and eBay! <---Might be weird but hey, still keeps them out of the trash, right? Although the blog says to lie them down length-wise, I chose to actually set them upright. I loved the idea of the different wine stained colors showing rather than the brand on the side. Preheat your glue gun. Set aside. 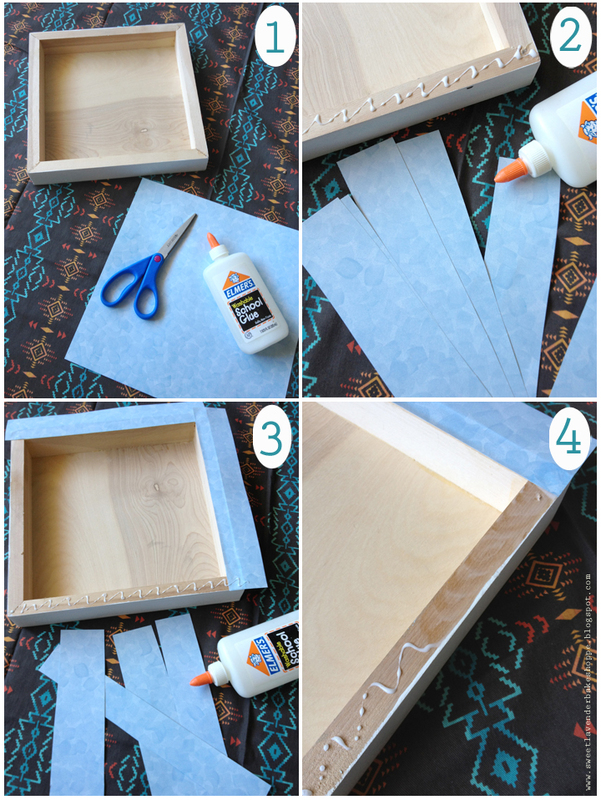 On a nice flat, clean surface make strips of your paper so that it is the length of the edge of your box frame. You will, of course, want 4 strips. Glue each strip down, allowing the overhang to..well overhang. Continue doing this until all 4 sides are covered. *Note* It works best to sort of smudge in the glue (I used my fingers) before adhering the paper. I found that if I didn't the lines of glue showed through the paper. Weird. While your board is drying, place corks inside your box and figure out how many you'll need. For the size of my box frame, I actually needed to half some corks so that I had a nice straight row. If you too need to half your corks all you need to do is cut down the middle with a nice sharp kitchen knife (large one) on a cutting board. I first made a careful cut from top to bottom, then bottom to top- then made a cut in the middle while it was on it's side. It helped the knife to go through the cork better. Now all you need to do is glue away! I made sure to add strips of hot glue to each side of the cork that would be touching something (i.e. : the wooden frame or another cork) AS WELL AS the bottom. Once you're finished, with your x-acto knife, carefully trim that overhang off the 4 sides. Embellish the corners with washi tape, buttons, stickers, etc. Add a hardware piece to the back so that you can hang on a wall. Here is the actual board embellished with little cute decorations (as well as some left over buttons I had). Because it was a gift, I also made two gift tags out of white card stock, washi tape, and letter stickers. Included on the board was a wooden initial and a handful of pushpins for her to use immediately! Cute! I wrote a post about cork boards and included a photo (and link) of yours. Thanks for the inspiration! This is such a fun project! I wanted to let you know that I featured it on my blog today as part of a roundup of unique framed art ideas! Check it out here: http://justagirlandherblog.com/unique-framed-art-ideas/ . Thanks so much for the inspiration!